Golfers may prefer certain irons over others. Golfers many times have a love-hate relationship with the irons in their golf bags. They love the short to mid irons, from wedges up to a 6-iron, because these clubs are easier to hit and give you the confidence needed to make a solid strike. Conversely, longer irons – typically 3- through 5-irons – frustrate many amateur players because they aren't able to get consistent shotmaking results with them. Inconsistency with long irons may result from not knowing which club to choose for a given yardage. The instruction book "Private Lessons" recommends hitting a series of shots with each iron and actually measuring how far they go. The average distance of all the shots is the distance you should trust when choosing a club. Golfers may make the mistake of thinking that because they once hit a 4-iron 210 yards, that's the yardage they should assign to that club. This approach leads to leaving the ball short more often than not, and also promotes overswinging in order to hit that maximum yardage, resulting in a loss of control. By using the average yardage you are capable of hitting, you can make a smoother swing with more reliable results. 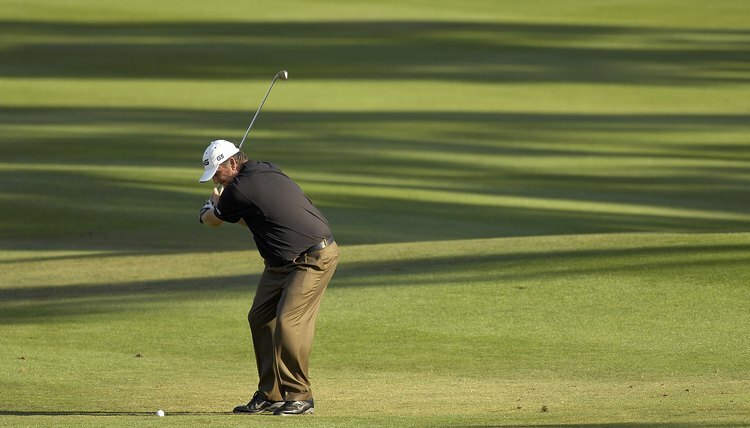 A "fat" shot with an iron is one in which the golfer hits behind the ball rather than striking it squarely. Fat shots can travel offline and fall well short of the intended target. In his book, "My Golden Lessons," legendary golfer Jack Nicklaus writes that fat shots are most often caused by excessive head movement. By dipping your head on the downswing, the path of the clubhead is lowered to a spot behind the ball. He also says to check whether you are letting your head sway to the right as you swing the club back -- this will have the same undesirable result, a fat or chunked shot. Pulled shots travel left of the intended target line – sometimes far left. Pulls are perplexing because the golfer may feel like he made a good swing and solid contact with the ball, but it doesn't come close to hitting the target. Nicklaus has found that pulled shots often result from positioning the ball too far forward when you take your stance. The club is moving inside the target line at impact. He suggests experimenting with moving the ball back in your stance in small increments until you stop pulling the ball. You should also make an effort to continue swinging the clubhead toward the target after striking the ball. This keeps the clubhead on the intended line rather than moving inside. Successfully getting out of the rough with an iron starts with club selection. Avoid choosing long irons, which can easily get caught up in the grass, causing the blade of the club to twist offline. Shorter irons work best. Play the ball back in your stance, at the midpoint between your heels. This helps you make a descending blow. If you stand slightly closer to the ball than normal, you will make a more upright swing which also helps you strike down on the ball. Try not to tense up by thinking that a firmer grip will help you better control the club. Make sure your arms stay relaxed so that you can generate sufficient clubhead speed to extricate the ball from the long grass.